This was our first time here and I have to say after going by several other local doughnut shops and seeing the lines forming outside I was surprised by the selection that they had at 8:30am. I had around 10 people ahead of me in line and thought the wait wasn’t bad at all. I would say around 10-15 mins we were in and out. I’m not sure if the place is dog friendly or not but Sadie got to hang out with me while waiting for the doughnuts and espresso. Heather and I stopped by Common Grounds Coffee last night for a quick espresso and just to relax and enjoy the atmosphere. 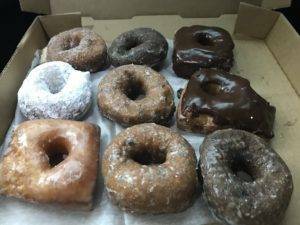 I definitely think that both places are very similar, Common Grounds has a larger facility but North Limestone Doughnuts has another location in the Stonewall Shopping Center and they just opened a new location in Louisville. I’m not a huge doughnut connoisseur but I do know a great fix to a sweet teeth and this place definitely is a hit.